Since I’ve built a ton of J-Poles and wire Antennas, I’ve wanted to build something different. I decided on a 3 element YAGI built for GMRS that is directly fed with 50ohm coax. 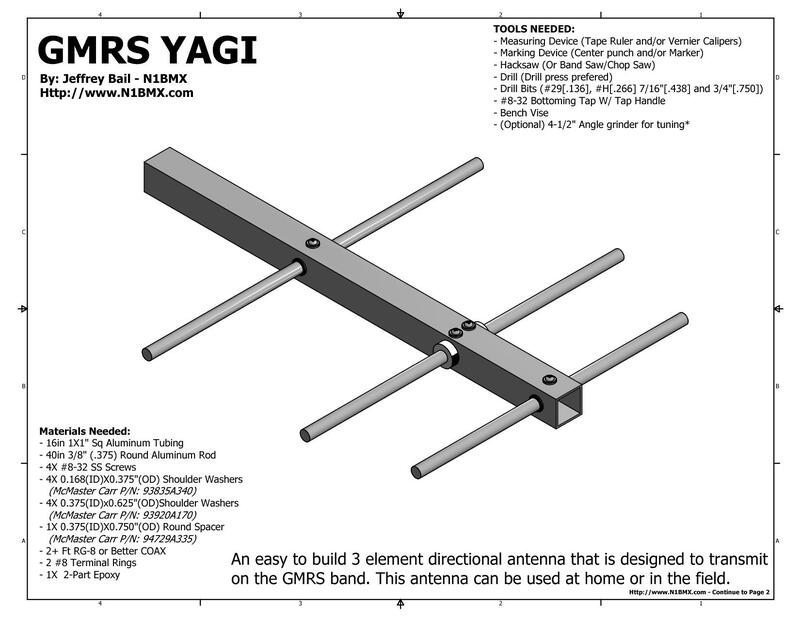 After a couple of failed yagis and the help of another ham on QRZ.com forums, I finally built a Yagi that works! 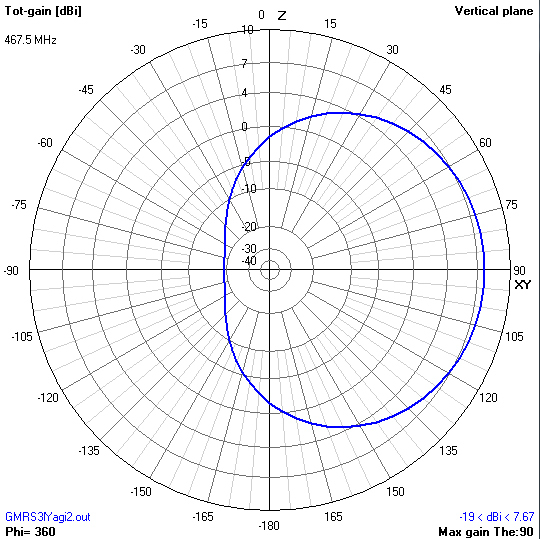 The reason I’ve chosen a Yagi built for GMRS is due to the ultra high frequency, which ends up being a small antenna. If I were to mess up (Which I did), the material cost would be low. I also wanted to use it on a GMRS repeater in the area. 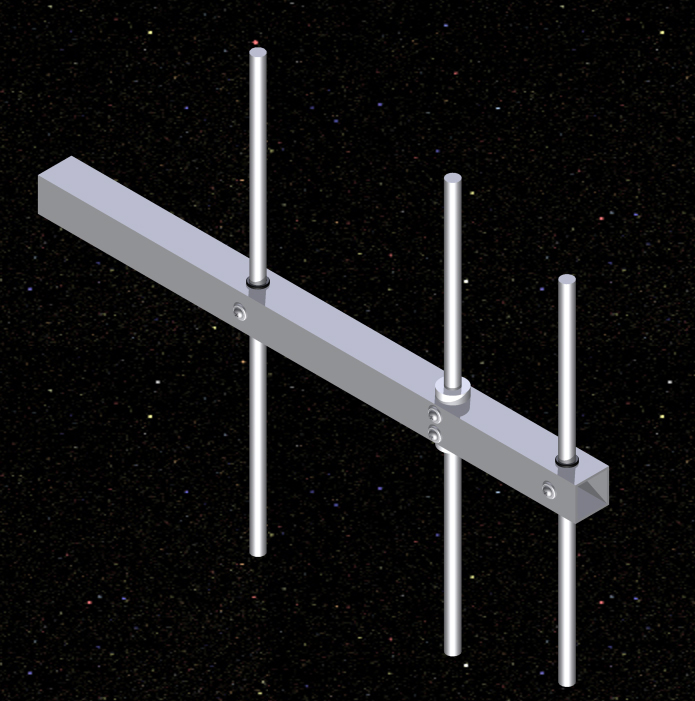 The first Design I used is with a Web Site that has a Java base applet to design the Yagi, After getting all the Dimensions from the website, I went to work building the antenna. After everything was done, I learned two things. One is that my drill press does not drill straight (90 Degrees) through the tubing. 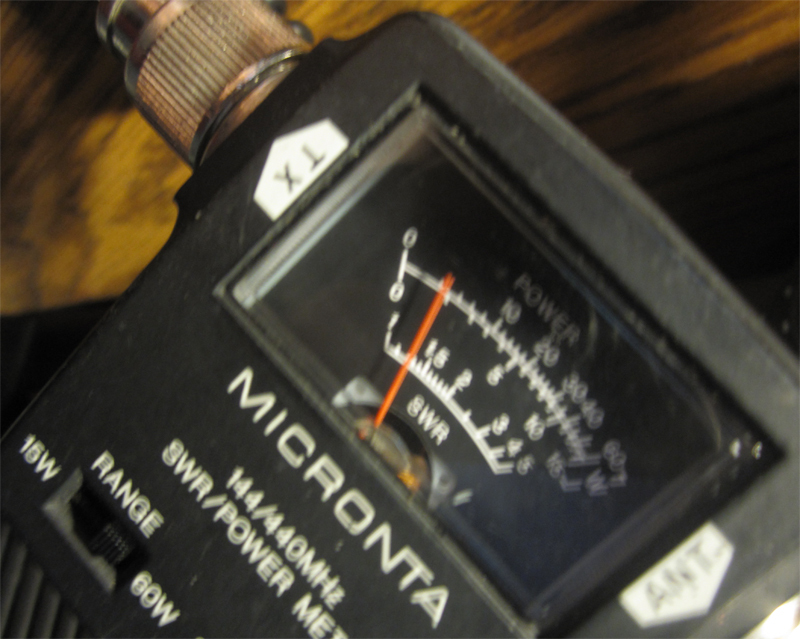 The other thing is that when I hooked up the antenna to a simple SWR Meter, That didn’t work either (Pegged the Meter). At this point I got frustrated and posted my issue on QRZ.com. A Ham by the call of WB3BEL (Harry) took my dimensions (That I got from the applet) and plotted my antenna into 4NEC2 software (Like EZNEC but freeware) and it would not work for the center frequency of the GMRS Band (or any part of the GMRS band). WB3BEL actually re-designed the antenna to where it would work so I give him credit and major thanks for help. I took his Dimensions, Modeled the antenna for fabrication and built the antenna. I Hooked up the antenna to a transceiver and SWR meter and got a 1.2:1 SWR and a 1.5:1 SWR on the outsides of the GMRS band. The Design is calculated to yield 7.5Dbi of Gain. Considering connector and cable loss (Lets say 4Dbi using 50ft RG-213 W/ 3 SO-259 Ends and a Barrel Connector) still yields gain of around 3.5Dbi which is not too bad. 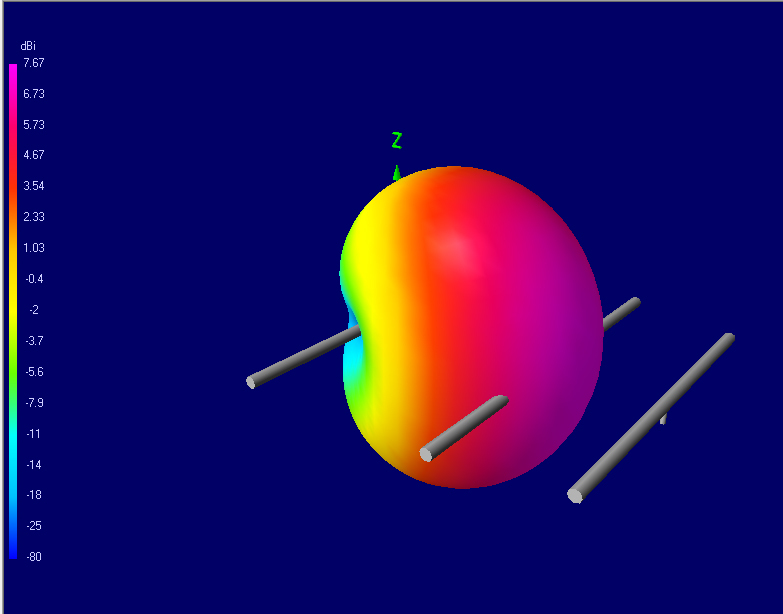 Here is rendered Image of the Antenna. The elements are Insulated from the boom using plastic shoulder washers for the Reflector and director. The Driven Element is insulated using a 0.750(OD)X.375(ID)X1.5″(L) Plastic spacer. Since the elements are going THROUGH the boom, It will make the elements electrically shorter so you have to compensate for the loss by adding 0.279528″ (7.1mm) to the element to correct the effect (Boom correction). The elements are secured using #8-32 Screws screwed to the boom. The screws are also insulated from touching the boom. The screws do not make any significant changes to radiation pattern of the antenna as long as it’s insulated from (not touching) the boom. I did notice that the screws actually lowered the SWR a tad which is great. I didn’t add a matching network to the antenna because I wanted an easy to build and assemble antenna which is the entire point of this article. The antenna is fed using RG-213 Coax with terminals soldered to the core and shield. I tried to keep everything as short as possible because this and the ring terminals effect the performance and SWR of the antenna. Here are a couple of screen shots from the antenna software that show the Radiation Pattern and gain. Nothing special here. 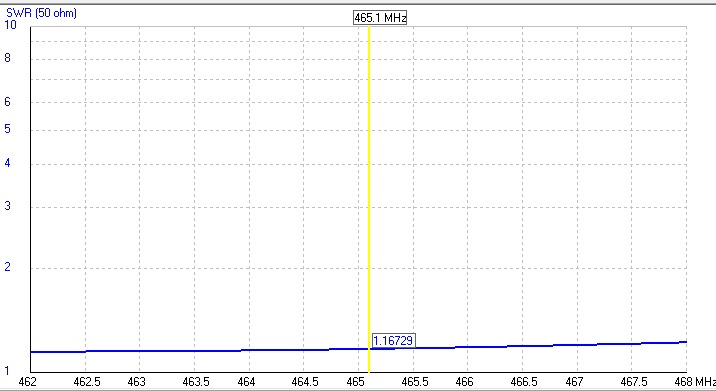 Here is the calculated results for the SWR of this Yagi. Please note that it’s in the ball park. By adding screws, coax leads and the ring terminals, it could or will effect the final pattern and/or performance of the antenna. Here is a SWR Shot. As you can see, I don’t have a very good meter. I would like to buy a HF/VHF/UHF Antenna analyzer for my Antenna builds but I don’t think that will happen in the near future. Here is the complete Antenna. Overall it was a fun little project. It took a short time to build and it’s a great directional antenna with some gain to help your signal on GMRS reach its destination. 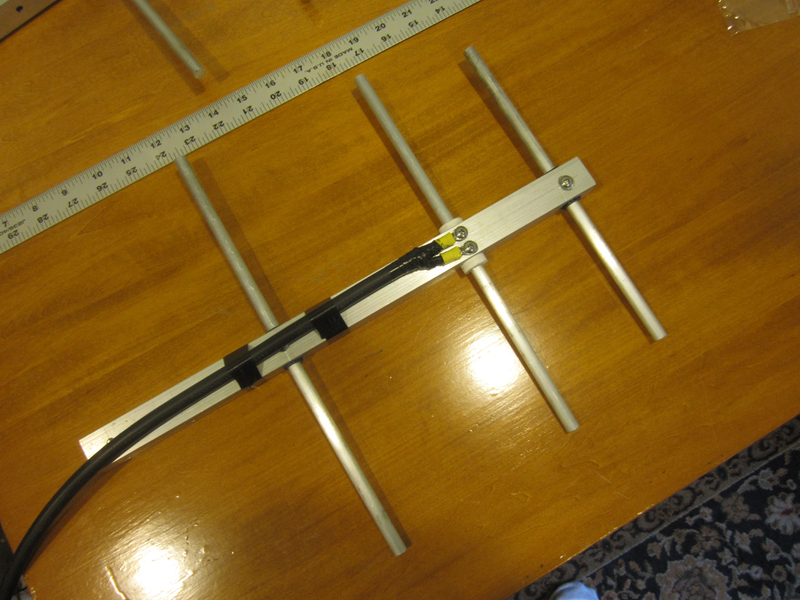 Continue reading if you want to build this antenna. 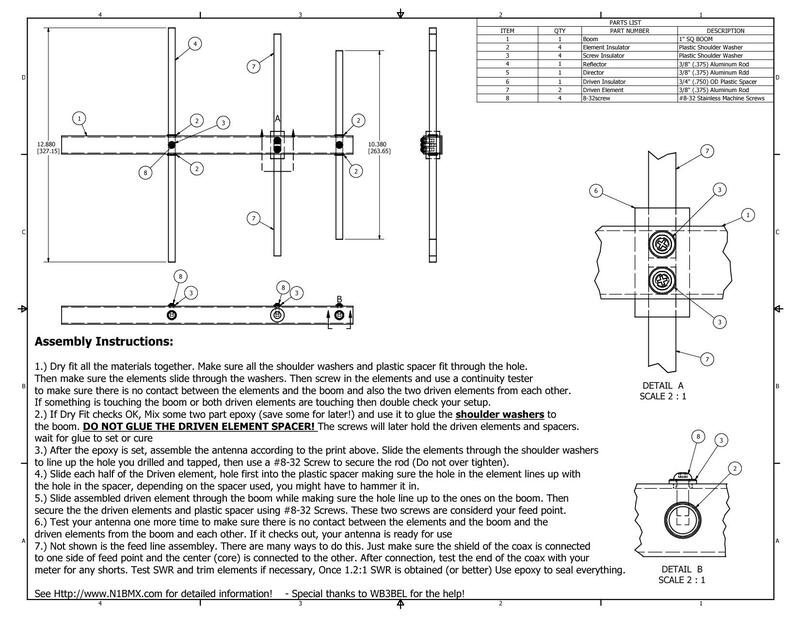 Here is the Blueprint (Download .PDF with the plastic parts detailed prints RIGHT CLICK -> SAVE AS) to make this antenna. The blue print contains just the basic step and directions assuming you know how to fabricate antennas or know your way around metal fabrication and/or machining. Posted below are detailed steps of what is in the blueprint above. I would say the most difficult steps are drilling and tapping the 3/8″ Aluminum rod. Along with the tools above, The following are the Preferred Tools to also have. If you do not have these Items, It’s not a big deal. You will just have to be more cautious and careful. you might end up quadruple checking your measurements before cutting and/or drilling. – Drill Press Or Milling machine with Drill chuck . – Using the Blue Print supplied above. Measure, Mark and cut the 3/8″ Round aluminum to the dimensions listed in the print (1pc 12.88 1pc 10.38, 2pc 6.04). Try to be exact here. If your using a tape measure, round UP to the nearest 32nd or 16th. You won’t be able to ADD metal but you defiantly can cut it shorter (or grind it if it’s close). – Using a Vernier (or tape measure), locate the center of the two longer rods and make a mark using either a marker or depending on the vernier your using, the vernier itself. Just in case measure from the other side and do the same thing so you know if your really on center (or you accidentally cut WAY too much or less). With the short driven elements measure in on only one side .188 (3/16″) and score a line and/or mark. – At this point you should also locate and mark the holes that are going to be drilled on the boom. I would suggest marking each hole individually even if you plan to drill completely through the booms for your elements. 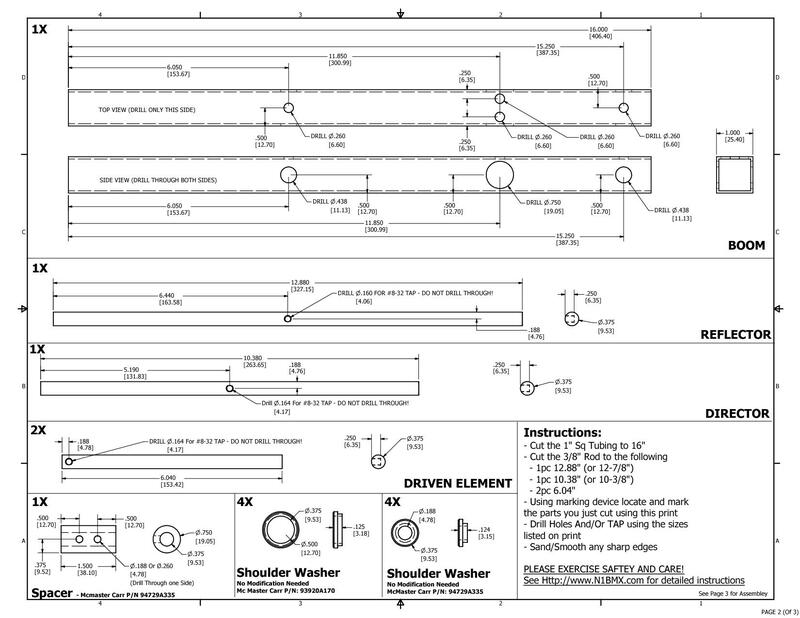 If you’re using U-Bolts or any type of mounting system, this is your chance to lay it out. – After everything is marked, Put each part in the vise and use a hammer and center punch to really mark the locations that you will be drilling. This way it will be very hard for the drill bit to “walk” on you causing a hole away from your mark. Try not to hit too hard on the boom or you will actually make a dent bigger than the mark. – Unless you have the proper equipment, this will be the hardest part. Find a way to secure the 3/8″ rod so that the Mark is perfectly stright up and down. There are many ways this can be done. Some people will put a couple of pcs of duct tape on the vise pads and secure the rod horizontally and eyeball the mark to make sure it’s stright. Others will mount it vertically and use a drill with a level. If you have a bridgeport or really nice drill press with a vise, then your all set. – Using a #29 (or .163″) drill bit, measure up 1/4″ (.250″) inch from the tip of the bit and place a piece of masking tape around the bit so that the bottom edge of the tape is at the 1/4″ mark. This will tell you when to stop drilling. You should not have to drill through the elements, if you do I am not sure what effect it will cause (if any). The only excuse I can see for drilling through the elements is because you don’t have a bottoming tap (or an extra tap you willing to sacrifice) or that your screws are going to be too long. – At this point I would use the #29 drill bit as the pilot hole for the boom, you can also decided to drill through both sides of the boom for the elements (Start drilling till it comes out the other side) or one side at a time. Unless you’re using a persision machine or your drll bill if perfectly 90 degrees to a flat table and material that is flat then I suggest working one side at a time. I plowed through both side to find out that my drill was off at an angle and ended up scraping the boom. – Once the Pilot holes are drilled, change bits to a “H” size bit (.266) and drill the 4 holes that you will eventually insert the screws into. – Change bits to 7/16″ (.438) and drill only the 4 holes that the director and reflector are going through. – Once again change bits to a 3/4″ (.750) bit. Some people may not have this bit or a drill with a chuck that can handle it. My suggestion is to purchase or get hold of a 3/4″ counter sink (doesn’t matter what angle). It’s much cheaper and depending on the brand, will fit into a 3/8″ Chuck. Since we are drilling through aluminum, the countersink will not get damaged. Now all the hard stuff is done. you can now assemble that parts according to what is written on the blueprint. The assembly is pretty stright foward as long as you’re using the print. I’ve labeled the parts so you should know where what does where. The only issue you might have is assembly of the driven element (DE). 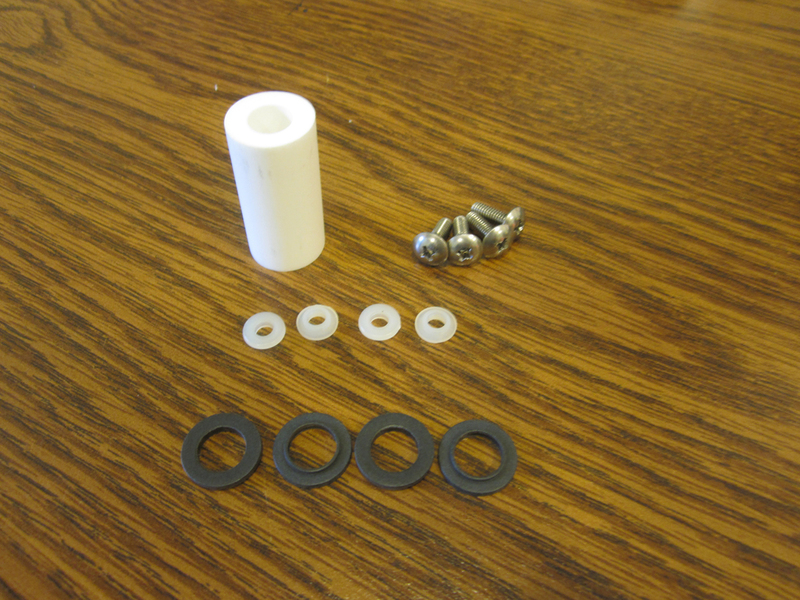 The plastic spacer that I acquired were small on the inside diameter. I had the put the space on a bench, line up the holes and hitting the element softly with a hammer. Then I made sure the screws threaded nicely, removed the screws and slid the DE through the boom the screw back in. If you have to adjust, mark each end of the driven element in 1/16 (.0625) increments and either cut of grind the element while constantly checking. When you grind/cut one side, make sure to do the same thing to the other. So be careful and try not to grind too much. After everything checks out okay more epoxy to weatherproof much of the boom and elements as possible. It seems that I made it look harder but It’s actually not that bad. I did everything using mostly hand tools (except cutting the 16″ boom) and it came out pretty well. Please note that I am NOT A MASTER antenna designer or builder. The reason why I posted this is to share to the Amateur/GMRS community on an antenna that I built that works for me. So if you see something obviously wrong, please don’t criticize. Just post a comment with detail to make it right or better. I do hope this writeup will help someone out. Hi Jeff, Excellent project and your documentation is really outstanding. I’m wondering about how you determined the correction factor for the elements passing through the boom. This has always been something of a puzzle to me. Any additional information regarding the method for determining boom corrections would be very much appreciated. Thanks and hope to see you at some HCRA meetings soon. GM George, Thanks for reading! I’m sure you know why a correction is needed but I’m going to repeat for others to see. The resonate frequency is effected by any type of metal near the element. The current would actually transfer (short) to the metal near the element (in this case the boom) and dissipate causing the element to be electrically shorter. The element has to be longer to compensate the loss. The basic way of figuring it out is to take 25-45% of the Boom Diameter (or Width of a Sq Boom). In this case I am using a 1″ Boom – 25% would equal .25″ that I would have to add overall to each element that is passing through the boom. However that is a vague number and wouldn’t satisfy in my situation since the boom diameter effects the correction. There are various formulas out that will calculate the correction. The formula I use is from DL6WU. BC = [733 * BD * (.055 – BD)] – [504 * BD * (.03 – BD)] BC is Boom Correction and BD is Boom Diameter (or Width for SQ boom) both in wavelengths. might seem like a dumb question but ho did you mount this to the antenna mast? also did you mount it vertical or horizontal. might seem like a dumb question but how did you mount this to the antenna mast? also did you mount it vertical or horizontal. Teddie, I mounted it vertically. There is a GMRS repeater that was just out of range which led me to design this antenna. The antenna is fixed pointing at the repeater. I have no other use. When it comes to GMRS, I wouldn’t mount it horizontally because almost all GMRS antennas are vertically polarized. You would have a much harder time making contacts. vertical works best for fm and horizontal best for ssb work..
thanks for the hard work and for sharing your lovely design with us Jeff.. Useful article, thanks for the boom compensation formula. Next Next post: Hello APRS My old friend.